Over the last 20 years, no sport has changed more than soccer. The modern player is technically more capable, physically faster and stronger, and has access to more coaching and sports science resources than ever before. With the high rewards associated with success, there has never been more pressure on coaches to win, develop players, and play soccer the ‘right way’. Aimed at Soccer coaches of all levels and with players of all ages and abilities The Modern Soccer Coach 2014 identifies the areas that must be targeted by coaches who want to maximize a team’s potential – the Technical, Tactical, Physical, and Mental sides to the game. Written by UEFA ‘A’ and NSCAA Premier licensed coach Gary Curneen – The Modern Soccer Coach 2014 offers contemporary focused and distilled insight into what soccer coaches need to do, and how! Filled with practical no-nonsense explanations, focused players drills and more than 30 illustrated soccer coaching templates, The Modern Soccer Coach 2014 will help you – the modern coach – to create team performances that win match after match! Understand how the game has changed and what areas determine success in the game today. > Create modern exercises that focus on tactical, technical, mental, and physical elements of the game. > Learn what sets coaches like Mourinho, Klopp, Rodgers, and Guardiola apart from the rest. > Develop a competitive and enjoyable atmosphere for yourself and your players. Gary Curneen shares soccer coaching philosophies and training methods from the most forward thinking coaches in the game today, along with guidelines on creating a modern environment for your own team. This book is not about old school methodologies, or ‘motivating’ players by screaming at them – it is about creating a culture of excellence that gets the very best from your players. By learning from successful current coaches, sports science, and the latest research – 21st century coaching can be easily grasped. Your players will benefit from a holistic approach to the game, as they develop winning habits and relish being part of a unique experience. This book explores how the best coaches in the world are pushing ahead, and gives the reader step-by-step ways to do the same. Who this Soccer Coaching Book is for. The Modern Soccer Coach 2014 is for professional and amateur coaches of all levels in the game. The book focuses on team soccer coaching, and the principles can be taken from youth level right to the professional game. 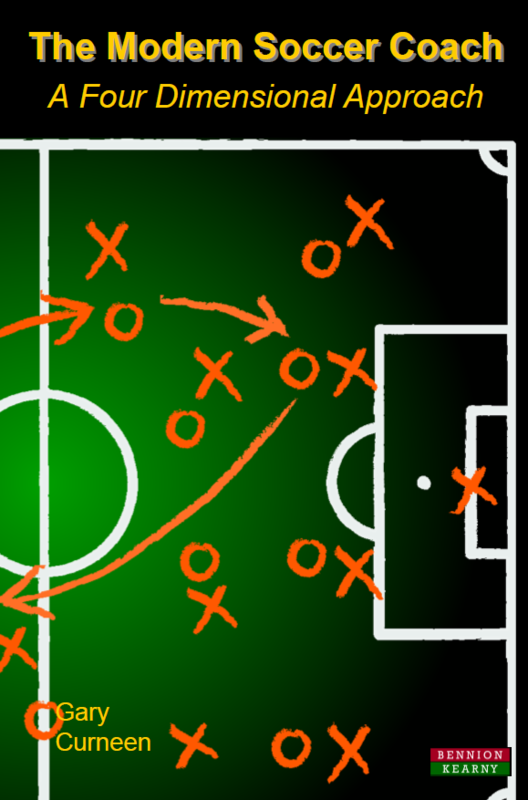 Chapter 2 – The Game Is Moving But Where Are The Coaches? Gary Curneen is the Head Women’s Soccer Coach at California State University Bakersfield. Gary holds a UEFA ‘A’ License from the Irish FA and a “Premier Diploma” from the NSCAA. Gary also gained a Master’s in Business Administration from Wingate University, where he coached the Lady Bulldogs to a 95-48-8 record along with their first ever SAC Championship and place in the NCAA Tournament. In 2013 he worked as the Assistant Coach at University of Cincinnati. Gary has played and coached at the collegiate level in the United States for more than ten years. His coaching education has seen him travel to study the best teams in the world and how they work first hand. A lifelong learner, Gary is a player-centered coach who focuses on professionalism, responsibility, and accountability within the framework of each team he works with. He believes that creating a culture of excellence is paramount to success and that each training session should include physical, tactical, technical, and mental components that challenge the players to perform at a high level. Book Categories: Gary Curneen, Soccer and Soccer Coaching Books.